NEW : You can now download this unit in Word format in order to customize and save it. All documents are available in PDF and Word formats. One entire month of planning done for you – I dare you to enjoy Shakespeare. I love teaching Shakespeare’s plays and I want you to love it too. I’ve been teaching and improving this unit for over 10 years. I have literally done all the thinking for you. 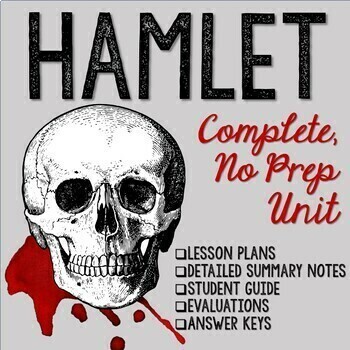 This unit has everything a teacher needs to teach Hamlet. I’m aware that not everyone is comfortable with Shakespeare. Because of this, I have created this unit from my years of experience teaching the play so all of the thinking has been done for you. Just photocopy and teach. Seriously it’s that easy. There’s no longer a need for hours of research and piecing together bits of information and activities found to teach the play. This is a whole, complete unit, from scene summaries, important notes and annotations notes to help students understand what they are reading. I have also included an introduction to the play, a student guide, a teacher guide, quizzes, a creative assignment, and tests (all with answers and evaluation grids), and a comprehensive answer key. Everything has its place and teaches a specific skill. In addition, I’ve used the 1831 edition of the novel to create this unit. The unit is appropriate for students in grades 10, 11 and 12. -A Teacher Guide (with detailed, comprehensive lessons, unit plan, and additional notes to guide students.) -9 pages and 16 complete lessons. The teacher Guide also includes links to the audiobook (the exact time to cue the audio) AND it includes a list of speaking roles if reading out loud in class)to help with time management and organization. -18 pages of comprehensive scene summaries and important notes for each scene (annotations for each scene) ***THIS IS A TEACHER FAVORITE! –A creative Hamlet Guess Who? Game to help students understand the characters. (What’s fun about this game is that it can be played from the beginning of the play right to the end, and students’ answers will change depending on the act they are reading.) LOTS OF FUN! -Comprehension quiz on Acts 1 and 2 in Word format for easy modifications (with evaluation grid) and answer key. Includes a total of 109 pages. Please note The Best of Teacher Entrepreneurs Marketing Cooperative was created by Victoria Leon and is not sponsored by Teachers Pay Teachers.